I'm back! Wedding went well, thanks for asking, and my sister is now blissfully wed (I assume). There was cake, revelry, song, and only a few broken objects, so I think overall we can call this a success. Well, yes, I was going to be back yesterday, but must you remind me of the little details? Today, while I gather myself and try to remember where I left all my stuff, let's talk about a little pop cultural phenomenon about which I have very, very mixed feelings. Let's talk about Curious George. Curious George, for those of you who...haven't been near a child in the last fifty years, I guess, is a series of short books and even an animated television show about a cute little monkey and his "friend"/owner, the Man in the Yellow Hat. The Man in the Yellow Hat is forever going off and doing things, asking George to stay still, and then being somehow surprised when the wild animal he keeps with him all the time gets into trouble. But it's okay. George is a lovable little monkey, and everything always always works out just fine. They're cute books, nice stories, and there isn't really anything overtly objectionable about them, aside from the weirdness of the whole Man in the Yellow Hat and his domestic situation (perpetually single man raising small monkey with no discernible job or source of income). And I can't say that I have a really defined perspective here. The Curious George books are cute, fun, and very enjoyable for toddlers, and the urge to call a small child a monkey is pretty understandable. At least, I think that's what the books are nominally about. The problem I have with them, then, has to do with the realities of the world in which they exist. Because it's a freaking strange world. Not only is there the whole Man in the Yellow Hat conundrum, there's also George. George is clearly a monkey, and yet he's allowed to live in a small house in the suburbs (or, in some of the stories, a small apartment in the city). George is almost a person, like when he gets a puppy, but not quite a person, as in when he does pretty much anything else. And for some reason, his appearance in strange places, like a pizzeria or a hot air balloon, rarely make anyone freak out to a level that seems comfortable when you consider that a monkey just appeared in your hot air balloon. More than that, though, what I have a problem with is the NPCs. For those of you who don't play videogames or lots of nerd tabletops, that means "non-player characters". The NPCs are the people in the background that the heroes interact with, but who never really make sense as fully fledged out people. In the Curious George universe, these characters are the ones whose stuff George is constantly messing up. 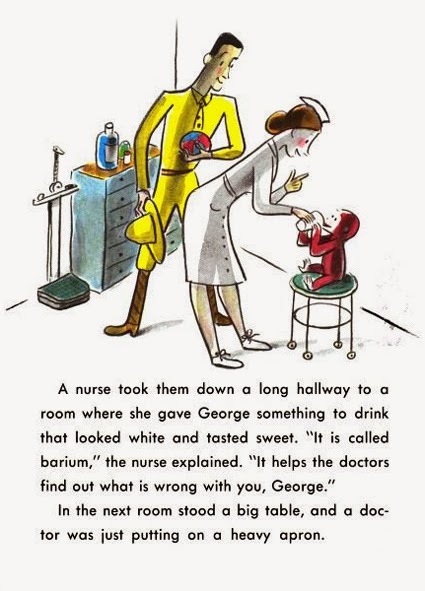 I mean, I like to think that after the third time George was specifically instructed not to do something and then he did it, the Man with the Yellow Hat might have wised up and realized that his monkey might be better off on a leash, but whatever. Maybe the Man with the Yellow Hat has some kind of neurological disorder or something. Actually, that would make a lot of sense. A lot more sense than the books currently make, at least. Anyway, the NPCs, whose crap George is always getting into, are really deeply unrealistic in these stories, to the point of giving kids an intensely skewed view of reality. When George gets bored, wanders off, steals a bobsled, crashes it, sleds down a mountain full of competitive skiers, nearly murders a man, then cheekily skies to the bottom of the mountain on just one ski, we're supposed to be happy that George is so popular with the crowd. I am not happy. That bobsled? That thing cost tens of thousands of dollars, and it is currently crashed into a metal pole. That bobsled team is going to be devastated by this, and they definitely can't compete today. And the skier? First off, he nearly died, no joke, when George crashed into him, and second of all, at the end of the story he's all, "That's okay that you broke my skis and pushed me out of the race that I've been training for for twenty years. I have more skis, and another race today. It's fiiiiiiiiiiine." And then he actually even thanks George for trying to kill him, and is so happy that the massive crowd of people stuck around for his second race (to see if he actually died this time), that he hoists George up on his shoulders to share the victory with him. 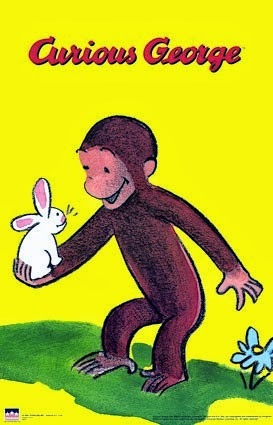 Look, from a moral perspective, I can't say that there's really anything wrong with Curious George. They're perfectly fine as reading material for your kids. But from a logical standpoint, these books frustrate me like none other. Nothing makes sense in them, and I guess there's a part of me that kind of wants to ban reading them to children because I don't support kids growing up with a distorted view of consequences and reality. This is not reality. This is some strange drug-fueled haze of weirdness that the Man in the Yellow Hat has fallen into after his diagnosis of schizophrenia. I think.